Jolie Maxtin: The Easiest - Ever! 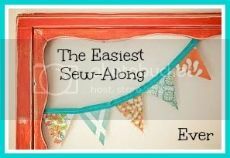 Kim, over at Windsor and Main has created the Easiest Sew-Along Ever. So you know me....I joined up! This one is different. The fabric, project, measurement and supplies haven't been determined yet - I get to decide. Isn't that lovely! Full details are here but I hit the highlights! The point is to reach outside of your comfort zone - I love it! So....I am going to finally tackle a zip pouch. Zippers scare the you know what out of me and I am going to just "get over it!". I am going to make a zip pouch! First up - Join the Flickr group - DONE! First one (of your fabric and/or your project inspiration) by May 6 - that's today! - You still have time - join us! and award prizes - woo hoo! Wow! Zipper pouches! I'm impressed... zippers scare me! Good luck! Oooo this sounds interesting! I might have to go check that out! Girl Charity Quilt - Check! Quilter's Favorites - Share Yours!